A music student from Cornwall, I study the oboe at the Royal Academy of Music and additionally play the piano and sing, having passed grade 8 with distinction some years ago. Alongside my passion for performing, I thoroughly enjoy the academic side of music, having been fortunate enough to also have been offered a place at Christ Church, Oxford, to study academic music. I hope to teach and inspire young people and offer an insight into the joys music can offer. 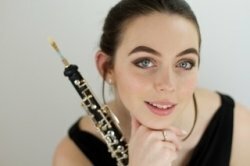 I have helped to coach various musical ensembles throughout my school career, and, as principal oboe of the National Youth Orchestra of 2016 have experience in leading a section and providing instrumental advice and help. Whilst I believe a thorough technique is fundamental to any instrument, music should also be a joy. I teach in an engaging manner and enjoy working with young people and passing on my passion for music. EleanorFrom Ben (5/5): Eleanor is very professional and supportive both within the lesson and during the week (answering questions on song choices, purchasing grading materials etc.) In a short space of time she has already opened my eyes to new ways to look at the musicality of the pieces I play as well as technical aspects where I had many missunderstandings and bad habits. I would certainly recommend her.